I’ve been whipping up a few beauty concoctions that I thought I’d share. * The Queen of Hungary’s Water. A blend of soothing herbs made into an astringent for your face. I use it after I clean my face. It is very refreshing and smells lovely. The recipe is from this AWESOME book. 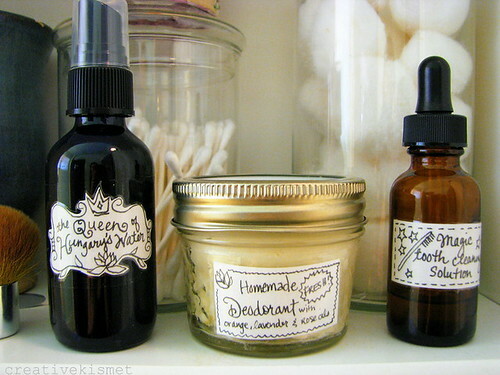 * Homemade deodorant ~ Amy’s recipe. This is my 4th batch. Each one lasts about 6 months. * Magic tooth cleansing solution. Also Amy’s recipe from her last mailorder issue. It’s not bad. It took a little bit of getting used to, but now I almost prefer it. ***Hair Update*** It’s been 2 months now since I last used shampoo in my hair. I’m just using the baking soda and water rinse and it is STILL magically working. I really can’t believe it. With the hot weather and me exercising almost daily, I’ve been having to rinse a little more frequently, but that’s okay. And check out our pretty little tomatoes. We’ve been happily eating a little handfuls every other day or so. My inverted tomato plant is just HUGE! This entry was posted in Grow, i make stuff. Bookmark the permalink. This is so cool. You are superwoman. I love that you are always experimenting + learning + making. i’m impressed. 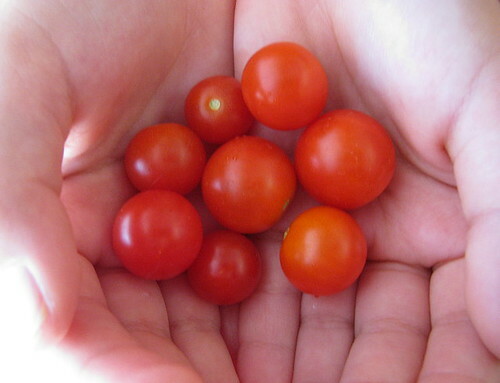 So jealous of your tomatoes! I can’t wait until ours finally start fruiting. How do you apply the homemade deodorant? It’s really warm here now and it’s pretty soft and easy to use. I really love it though. Can you give the specific mixture and directions for the baking soda hair wash? Is there any place that speaks of the benefits of this method rather than shampooing? I mix 1 tbsp baking soda with 1 cup water until baking soda is dissolved, then pour it into my hair, a little at a time, working it into all of my hair (my hair is VERY thick and long). There are other methods too. Some people make a paste and work it in. Here is a really good link for you to look into it further.